Kefir is a traditional food that originated in Turkey, where it’s name means “feel good.” The friendly bacteria in kefir help to convert the tryptophan in milk to serotonin, the brain chemical that makes you feel happy. Kefir is a great, nourishing base for fruit smoothies. It can be served with granola or eaten straight from a spoon with a little fruit or maple syrup and vanilla. It’s also one of the best liquids to use for soaking whole grain flours for baking. We’ve used yogurt and buttermilk too, but our homemade bakery items always turn out best when we use kefir. We don’t have very many soaked grain recipes posted yet, but here’s our favorite cracker recipe. The crackers really do taste like wheat thins. Another way we use our kefir is to collect whey for cultured vegetables and fruits. To get whey out of kefir, line a colander with a clean white cloth (a flour sack towel works well), put the colander in a bowl, and pour a cup or two of kefir into the cloth. You can let the whey drain through just like this, but the way to get the most whey out is to tie the cloth up and hang it above a bowl to drip slowly. The liquid that comes out is whey. The soft, cream-cheese-like stuff that remains in the cloth is actually a very simple cheese my German cousin calls quark. Add a little honey and cinnamon to this quark and use it as a dip for apples. The directions that come with these kefir packets seem wasteful to me. They say to use one full quart of milk to make the starter and then to use just one cup of starter to make your first gallon batch of kefir. But if you’re just going to use one cup of starter to make your first gallon of kefir, why make a quart of starter? Right? You can make four times as much kefir using my directions instead. In each packet, there is approximately 1.5 teaspoons of kefir culture powder, which is enough to make a quart of starter. So to make just 1 cup of starter, we’ll use 3/8 teaspoons of powder. 1. Heat 1 cup of milk or young coconut water to skin temperature (92 degrees). 2. 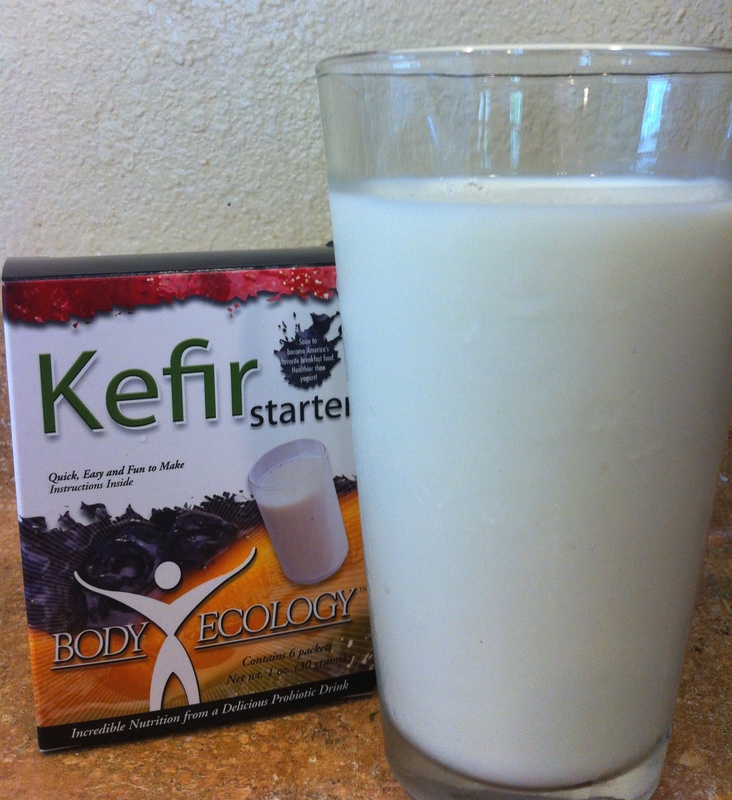 Add 3/8 teaspoon of kefir culture starter powder to the milk and stir until it’s dissolved thoroughly. 3. Pour the inoculated milk into a glass or crockery container that has a tight fitting lid – a canning jar is perfect. 4. Set the jar on the counter. Do not shake or stir it. The milk will thicken, and may become somewhat clumpy, and have a distinct sour aroma. 5. Now use this starter to make up to a gallon of kefir by adding fresh warm milk, and save one cup of kefir from each batch to make the next batch. You can do this seven times. Use the proportions here to make whatever size batch you choose. I find that kefir can take anywhere between 8 and 24 hours to ferment, depending on the temperature in my kitchen. So a great time to start a batch is right before you go to bed. When you wake up, your kefir might be ready, but if it’s not, you’ll have all day to keep an eye on it. When you leave kefir out too long, it separates. It’s fine if that happens, but it’s not as appealing to eat. Transfer your kefir to the fridge when it’s done. It will keep for about a week.